This past weekend, I headed down to Rondeau Bay to have a relaxing few days at the cottage. Usually this consists of boating, fishing, campfires, and enjoying the backyard scenery. Unfortunately, Saturday brought windy, rainy weather, so I couldn’t enjoy many of these activities. Even though Mother Nature was not being cooperative with my weekend plans, I still decided to go out and see what kind of things I could find in the rain. This was a great decision, as I found a very cool green frog (Lithobates clamitans). Green frogs are abundant in the Rondeau area, and you can hear them calling to each other almost every night, sounding like the ‘twang’ of a rubber band. Listen to the call of the green frog here. If you find a frog that has big round discs (tympanum) behind its eye, this is a good clue that you’ve found a green frog. 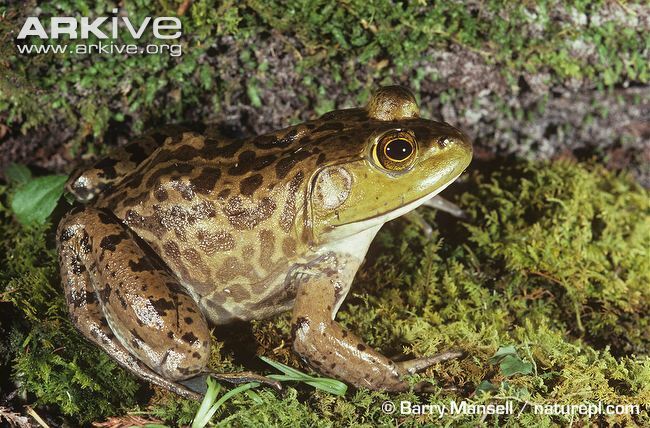 Green frogs and bullfrogs are easy to mix up, however, since they both have large tympanum, and similar colouration. 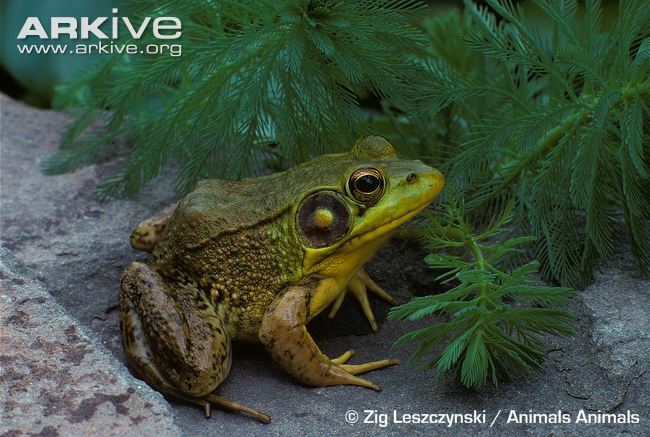 To distinguish green frogs from bullfrogs, look to see if there are raised ridges of skin along the back of the frog. If there is, you probably have a green frog. The reason that this particular green frog that I found was so cool was because of its colour. This green frog was blue! I had never seen a blue frog in Ontario before, so I was excited. 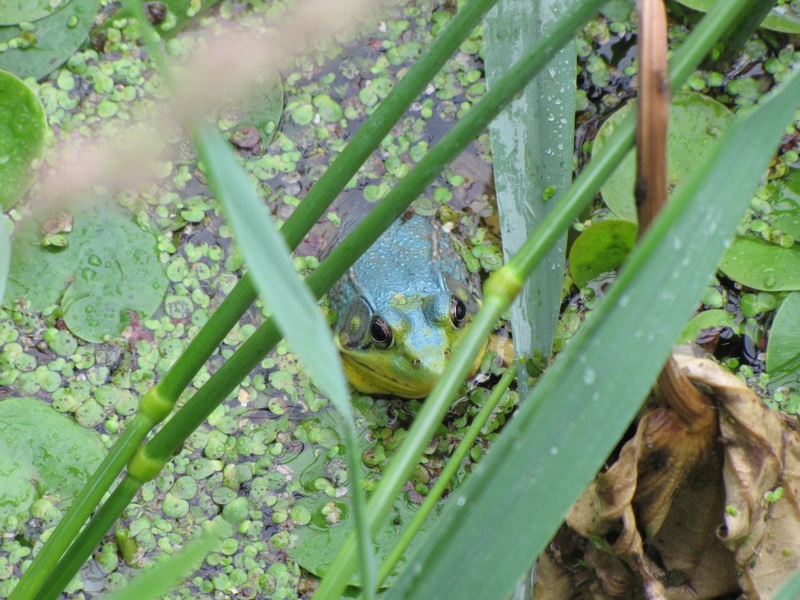 I was even more excited when I found a different blue-coloured green frog later in the day! The blue morph of Lithobates clamitans is considered rare, so I was lucky to find two different frogs in the same area. When I looked into why some green frogs have this colouration, I found an explanation. Green frogs are normally green because of something called iridophores and xanthophores. Iridophores and xanthophores are pigment cells that work together to form the green colour of the frog. Blue wavelengths of light reflect off iridophores that are covered in a screen of xanthophores filled with yellow pigment. The yellow xanthophores over the blue-reflecting iridophores creates the green colour that we see. Amphibians with blue skin are lacking the yellow pigment, so when the blue light is reflected, it is not filtered with yellow, and the skin appears blue. The yellow xanthophore pigments are often not present, or are replaced by a differently structured pigment cell in blue coloured frogs than in green coloured frogs. It doesn’t seem to be clear whether these frogs get their blue skin passed down to them from their parents, or whether it is an environmental trigger that causes the yellow pigment to change. Maybe the two blue frogs I saw were from the same parent or parents, or maybe they grew up in a certain area of Rondeau Bay that somehow halted the development of their xanthophores. Either way, it was really cool! My next blog post will have even more cool stuff about Rondeau Bay, since the BIObus is heading out to Rondeau Provincial Park next week! 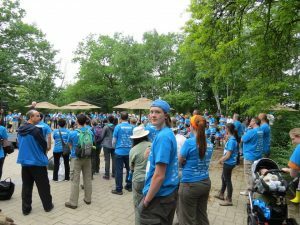 Hello everyone, a couple weekends ago my colleagues, along with hundreds of other biologists and myself, were busy blitzing the Don River Watershed for the 2015 Ontario BioBlitz. The goal of a BioBlitz is to identify as much of the flora and fauna in a specific area in an effort to demonstrate the local biodiversity. Here is a picture of me at the opening ceremony at the BioBlitz. As you can see the courtyard at the Ontario Science Centre was packed full of biodiversity enthusiasts. There many different groups of people contributing to the BioBlitz. There are people organizing and taking people out for a guided blitz, which focuses on the educational side of things and was great for anyone who wanted to come and learn about the local wildlife. There was also many people organizing the whole event and managing the incoming data from the Blitz teams as they are out collecting and identifying the biodiversity. The Blitz teams are out in the field identifying the organisms that are specific to their group and are usually led by a skilled taxonomic leader. The groups range from fungus to birds, grasses to moths, and everything in between. 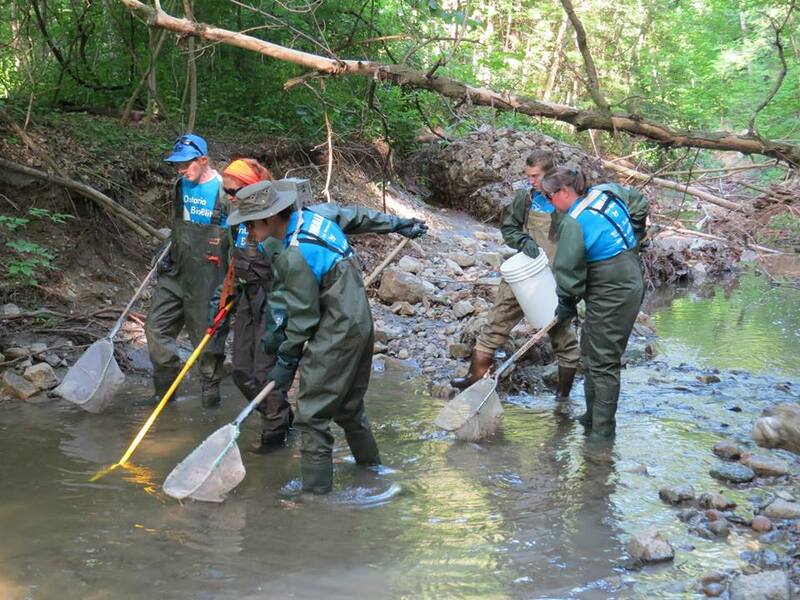 I personally was part of the Fish BioBlitz team and our goal was to identify as many fish species as we could throughout the Don River Watershed. 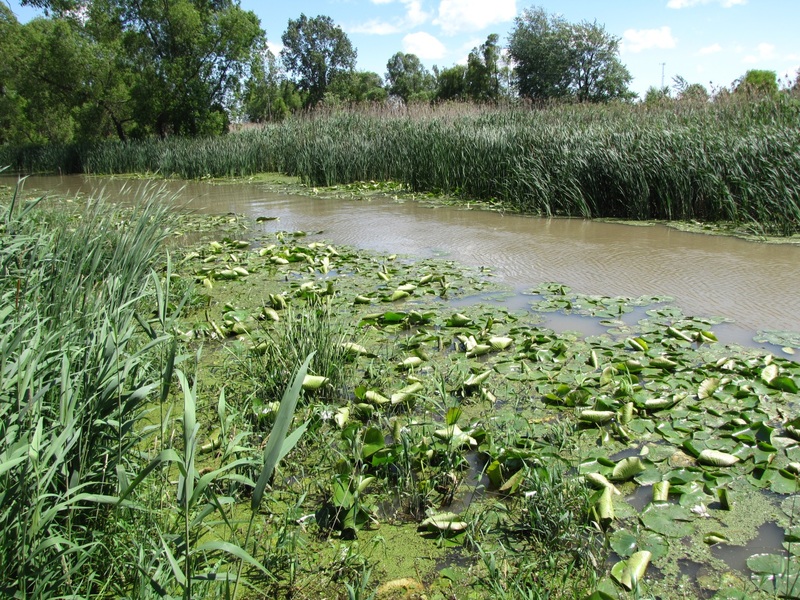 We accomplished this by separating into about five different teams each covering different section of the watershed. The team I was with was assigned a section of the watershed along the Don River. Our team leader was certified to electrofish, which we took advantage of, as it is a great tool for the safe capture and identification of fish. In this photo, the fish team and I were electro fishing a small river in the Don Watershed. At the end of the yellow pole, submerged under water is the electric cathode that emits the electric current. We stand around the person holding the electrofishing unit with nets to scoop the fish as they are attracted to the electric current emitted from the cathode. We also used a seine, which is a vertical net that you drag through the water and pull towards shore when you carefully examine the catch in the net. Our Fish team found different species of fish: fathead minnow, creek chub, longnose dace, blacknose dace, redside dace, common shiner, pumpkin seed sunfish and white sucker. Overall the entire BioBlitz was a great success with around 1120 species identified and possibly more to come as samples are continued to be identified. We also got to start working with our new BIO boat. 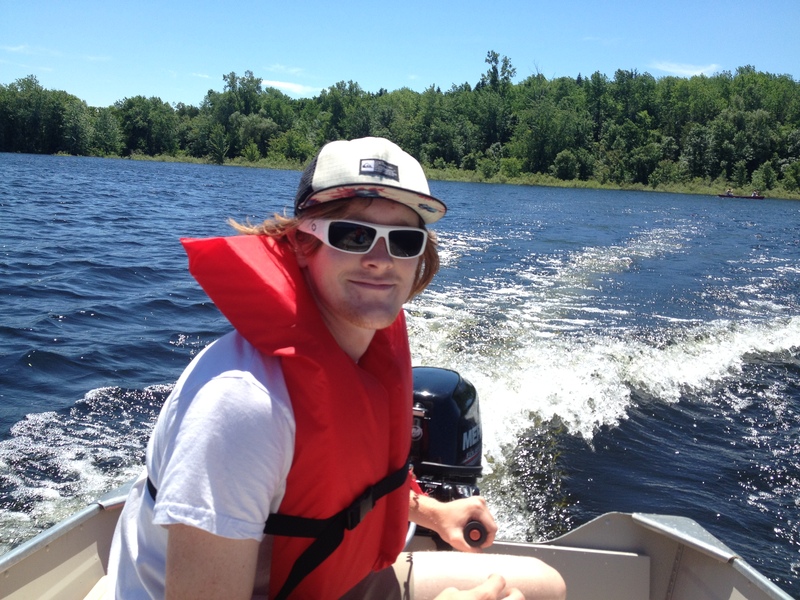 Crystal, Kate and I took the boat out for its maiden voyage to break in the engine at Belwood Lake Conservation Area. We tested out our new Schindler- Patalas plankton trap while out on the water. You tie a rope to the top of the trap and lower it into the water vertically until you have reached the desired sampling depth. The key feature of this trap is that once you begin to pull the trap to the surface the lids close and you retain a sample of the water from your desired depth. 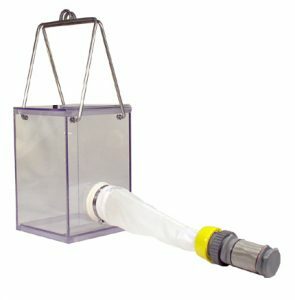 The zooplankton and other creatures are then captured in the container as you drain the water out once you have brought the trap out of the water.